The historic icon of the Sacred Monastery of Strofades near Zakynthos was in olden times kept in Constantinople. During iconoclasm it was the custom of the pious to throw certain icons into the sea, leaving it in the hands of God to lead them where He wills, much like the infant Moses of old. To save this particular icon of the Mother of God from maniacal icon smashers, it was thrown into the sea. While in the sea, the icon stood upward and was guided to Strofades Monastery in the Ionian Sea near Zakynthos. The Abbot and the monks received the icon with great joy and supplications from the sea and placed it in the katholikon of the monastery. They named it "Thalassomahousa" (Slaughterer of the Sea) because the icon fought the waves of the sea to arrive at Strofades Monastery unharmed. 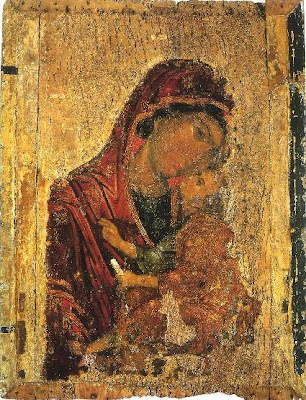 Today the icon resides in the Metropolis of Zakynthos. It is celebrated yearly on August 15th.